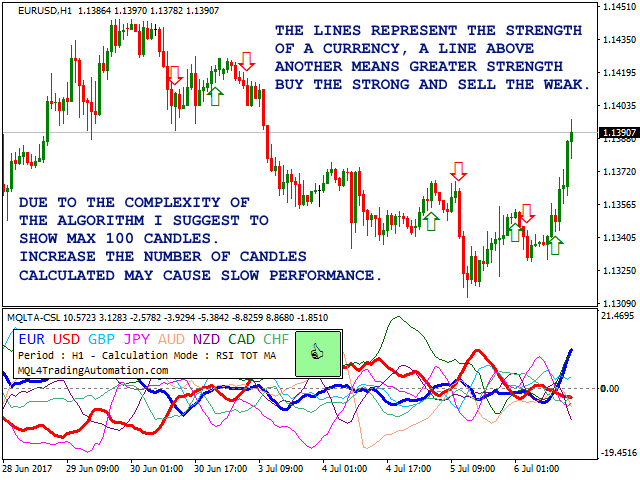 The Currency Strength Lines (CSL) Indicator is a very useful tool for both beginner and experienced traders. 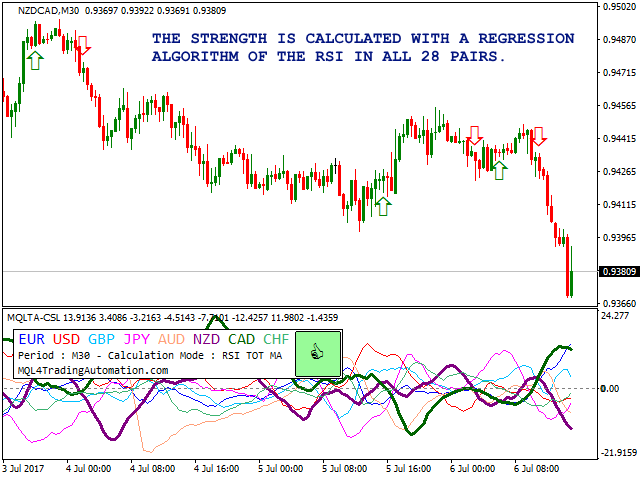 This indicator is able to calculate the strength of single currencies and show them in a graph so that you can see the trend and spot trading opportunities. The CSL Indicator gives you the possibility to choose from different methods, once the method is selected the Indicator will run calculations on all the 28 pairs, resulting in the overall strength across the market of individual currencies at any given moment. You can use this data to spot currencies that are strong, getting stronger, weak, getting weaker. A line going upwards means that the currency is gaining strength. A line pointing downwards means that the currency is becoming weak. A line above another one means that one currency is stronger than the other. Flat lines, or almost flat, represent currencies that are maintaining the current strength. A line above zero is likely to have a bullish trend against currencies below zero and vice versa. 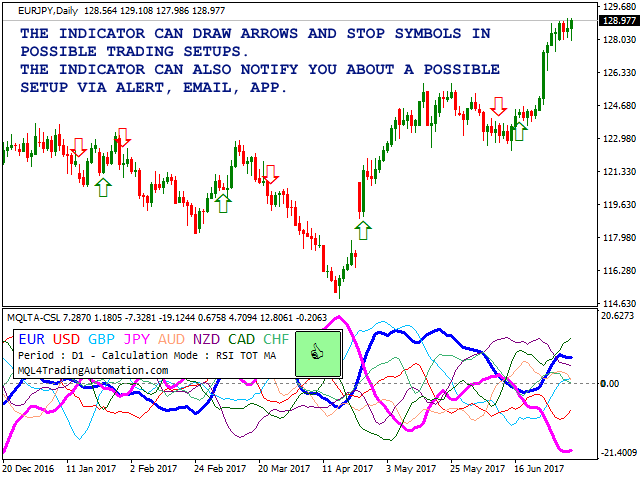 If the option is enabled, the indicator will draw arrows for possible BUY or SELL signals in the current symbol. Notifications are available only in the paid version. Depending on your trading style you can use the CSL Indicator for long term and or scalping, better to confirm the entry signals with another indicator or price action. Diverging lines, that is where a currency is gaining strength and the other is losing strength. Better when a line above zero and one below. BUY the STRONG and SELL the WEAK. Why you should use the CSL Indicator? filter the pairs to trade, showing which currencies are strong and which are weak. Open all the 28 pairs containing the 8 major currencies and the timeframe that you want to test, allow some time to download the historical data. 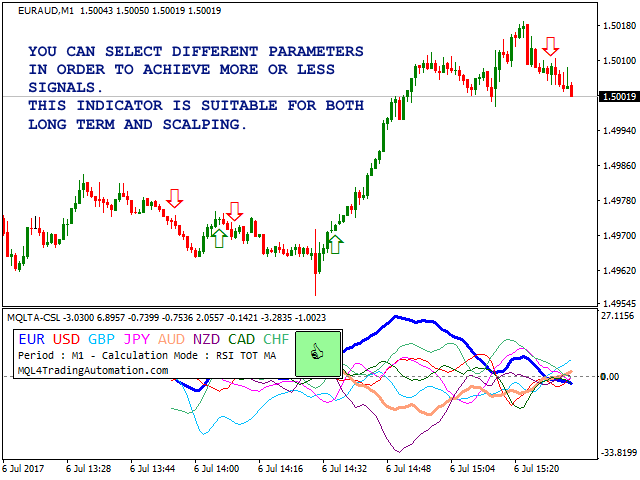 Load the indicator in the strategy tester and choose your preferred parameters. Select a period to test that is quite recent to make sure that the historical data for all the 28 pairs is available. This DEMO is provided FREE, so that you can see the indicator in action. For the full version, please check https://www.mql5.com/en/market/product/22398. Indicator's Name - the name of the indicator, this must be different if you intend to add more than one instance. Calculation Mode - calculation method, choose the more suitable to your trading style. RSI Period - period of the RSI in case you select a method using the RSI, suggested between 10 and 50. RSI Smoothing - period of the moving average to smooth the lines when RSI MA is selected, recommended between 2 and 10. Number of bars to calculate - number of bars to consider, above 1000 will cause slow loading time. Pairs Prefix - the prefix of the pair. Pairs Suffix - the suffix of the pair. Corner to show the labels - Top or Bottom, Left or Right. Horizontal offset (pixels) - Horizontal Spacing. Vertical offset (pixels) - Vertical Spacing. Label Color - color of label. Width for Currencies not on chart - recommended 1 to 5. Width for Currencies on chart - recommended 1 to 5.